Some time ago, when I started this review of past meetings of the Representative Assembly of the Confederation of Democratic Simulators (CDS), I thought I would quickly catch up with the present. But during the past months my real-life professional responsibilities have taken up all my time, and I've been falling further and further behind. So I'm just going to finish this present post, which has been in the works for too long, and then do a fast-forward to the present. The previous instalment took us through the RA Meeting of 26 October 2008, in which Arria's Monastery Sim was ready to be developed under the In-Theme Expansion Act. Also at that meeting mention was first made of a possible a fusion of CDS with Al Andalus, another democratically-run region in Second Life. But the day after that meeting, on 27 October 2008, Jack Linden announced changes to the prices of the OpenSpace sims, which dealt a severe blow to Arria's project. I've already given an account of the OpenSpace fiasco. The OpenSpace sims, which were an upgraded form of Void Sim, had become so popular that they were undermining the Lindens' regular sim market. 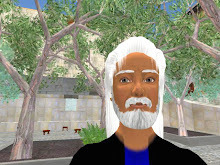 On 27 October 2008 Jack Linden announced on the Second Life blog that the OpenSim prices would be increased. For what followed, including the introduction by M Linden of a new product called Homestead sims, see my blog post OpenSpace Revisited. At the RA meeting of 9 November 2008 the first item of new business was Jamie Palisade's proposed swap of one of his Neufreistadt parcels, which had been used to expand the CDS information center on the Platz, for a nearby parcel that was underused as a "store for citizens." The RA members were willing to approve the swap if the prims and fees on the lots were the same. There followed a laborious search for this information, including links to the old Neufreistadt site (broken link) and to a Google spreadsheet of the CDS Parcel List. The RA finally voted to approve Jamie's land swap "subject to any fee differences to be paid." Just after the vote, Brian Livingston found the information, which showed that Jamie would pay a slight increase in fees. The next item was a discussion of CDS policy regarding void sims and public spaces. Arria Perrault opened this topic by noting that previous sims had been added using various mixtures of public and private land, and with different fee systems. The resulting system was complicated, and Arria suggested that there was a need for calculations in order to understand the existing CDS land rental system, and for a general policy of land management. Gwyneth Llewelyn asked Arria if she meant that every sim should have the same amount of public vs. private space. Arria replied that her idea was that since every sim has a certain amount of public space which is financially supported by the private space, all the sims together could pay for a void sim. Symo Kurka observed that the General Master Plan already gives an outline and figures on how to develop CDS territories. Justice Soothsayer added that the Linden's change of void sim rates probably meant that the numbers would have to be run through again. Arria responded to Symo by noting that the GMP was not like a law. Justice noted however that the GMP was approved as guiding policy. Moon Adamant reported that the Guild was trying to make projections of the additional cost of void sims – a task complicated by the recent change in SL policy. For instance, if a water sim was to be used as a connector, but had an island with a lighthouse for one inhabitant, they could calculate how much that inhabitant would pay per square meter, and how much CDS would support. Arria repeated that she felt that calculations should be made taking the entire CDS into account. Justice noted that fees could be graduated depending on the type of plot, for example, either giving subsidies to commercial plots to encourage business, or on the contrary charging commercial plots more, on the grounds that they take up resources. Symo used Justice's remark as the occasion to introduce a new idea: using certain public spaces to rez visual landmark-givers to advertise CDS activities. Gwyneth observed that Symo's proposal came down to paying the cost of public spaces out of the CDS marketing budget. Arria offered to give some numbers: CDS at that moment had 43744 prims in private use. Arria stated that a slight increase in the price per prim would have little effect on resident fees but a big impact on the CDS finances. Gwyneth interjected that the overall "price per prim" on the Second Life grid was estimated at L$2/prim. Gwyneth then turned to Sudane Erato, to ask how much CDS paid for tier at that time. Sudane said she was still working on this data at the request of the New Guild. Symo replied to Arria by noting that sims are different, each having its own density, number of residents, ratio of prims. Arria continued with her argument in favor of a global approach to CDS finances, noting that Alpine Meadows brings a lot of money to CDS that could be used elsewhere. At that point Gwyneth produced the results of her rapid calculation. CDS paid tier fees for two sims at 195 US$/month (the older Neufreistadt and Colonia Nova cost less) and for two sims at 295 US$/month (Alpine Meadow and Locus Amoenus), making a total cost of 980 US$/month, or about 265,000 L$/month. For 45,000 prims that came to a bit less than 6 L$/prim. Arria objected that CDS income was more than 980 US$/month, so Gwyneth specified that her figure represented each citizen's contribution to pure tier costs. Moon agreed that it would be interesting to study how to make tier uniform. Arria thought the price paid by residents was about 10 L$/prim. Gwyneth emphasized that the average cost of mainland sims is estimated at 2 L$/prim, and the new Homestead sims at 10 L$/prim – she forgot the estimated cost for OpenSpace sims, but noted that the new policy would render these fairly useless. At an average cost of 6 L$/prim for the CDS island sims, the average resident fees of 10 L$/prim bring CDS a surplus of about 200,000 L$/month. Arria suggested that one could use the available figures to estimate the percentage of prims that would be public on each type of sim. The calculation takes into account the cost paid to LL, the revenues coming from landowners, and the number of sims in private use (since revenue is only collected for private prims). Moon replied that the present General Master Plan prevents making such estimates for void sims, since the main sims have densities that cannot be furnished with low-end products such as void sims. The three available products were full sims (with 11,250 prims), the new Homestead sims (with 1750 prims) and the revised OpenSpace sims (with 700 prims). The absence of a middle-range product means that low-end products could only be used for the lowest density areas in the Master Plan. Arria insisted that everyone stands to benefit by the introduction of void sims, to improve the landscape and view, and that everyone should therefore contribute. She pleaded: "we are a community and not a confederation of sims." There should be a general policy, rather than separate policies for each sim. As it is, Alpine Meadow which is full in fact pays for Locus Amoenus which is not. Gwyneth conceded that Arria seemed to be arguing for more fairness in the way different citizens contribute to CDS development, and suggested that the Treasurer and New Guild could analyze the fee policy using spreadsheets. Arria hastened to add that she would like to participate in the calculations. Symo was dismayed at the idea that all citizens might have their tier changed. Gwyneth concluded that although it would mean lots of work for certain people, a detailed study of the current price structure would provide greater transparency, even if it led to no changes at all. Justice finally formulated the proposal as follows: "that the RA asks the Executive and the New Guild to propose a new pricing structure, taking into account the Masterplan, that makes each citizen contribute more fairly towards the overall public spending, and to explore the financial implications of voids versus other kinds of possible new sims." The motion carried, and the meeting was adjourned.